Little Bernera self catering accommodation sleeps 10 people, ideally situated in the heart of Stornoway, just a short walk from the ferry, supermarket, shops, bars and restaurants. Three double bedrooms and four single bedrooms with linen, duvet and towels etc included at no extra cost. All bedrooms have TV with freeview. Has gas central heating throughout. There are two fully equipped kitchens one with dining area including washing machine. Two Shower/Bathroom room also hairdryers available. There are two lounges one with a Dining area, both have seating, TV/DVD/CD player. Enclosed garden with decked area with seating and barbecue. Off street parking also available. Smokers must go outside to smoke, sorry no smoking on the premises. 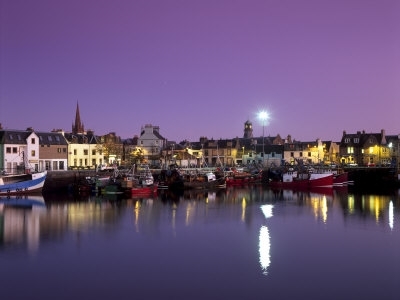 This accommodation is centrally located in the town of Stornoway, which has a beautiful harbour with many local fishing boats and also many boats arriving there from all over the world. You could organise your own boat trip and do a spot of fishing or just take in the views of the unique coast line. The town is overlooked by the wonderful Lewis Castle and its spectacular grounds, which are a must for a leisurely walk or cycle around. In the castle grounds there is also an 18 hole golf course. Stornoway also has a new leisure centre with games hall, gym, running track, climbing wall swimming pool, sauna and Jacuzzi. A new arts centre has also been built with many exhibitions and local artists work on display, it also houses a new cinema. An excellent location to stay for the Hebridean Celtic festival which is held in July each year, only a few minutes walk away. The town also boasts many excellent bars and restaurants from local cuisine to foreign eateries. All of the above are within just five minutes walk from the accommodation. If you wish to explore more of the island there is much to do and see, from visiting the ancient Callanish stone circle to surfing the waves on one of Lewis's many white beaches. Enjoy some loch fishing or go hill walking in the beautiful hills of Uig or Harris all of which can be done in within 45 mins drive from the accommodation. The world famous Harris Tweed can be found in some lovely shops in the town centre, you can buy it by the length or pick up some of the wonderful hand crafted product from ipad covers, dog collars and clocks to coats, waistcoats and slippers. or you could go and see it made for yourself by visiting one of the mills or weavers around the Island, a must see on a visit to the Isles. Airport within 10 mins drive. Ferry terminal just a 5 min walk. Nearest beach 10 min drive. Bus station 5 min walk. Clothing shops, chemist and supermarket all within 2 mins walk.